Here is the first piece in a three-part series on the Global Compact on Refugees and Global Compact on Safe, Orderly and Regular Migration. This one is a primer on the two Global Compacts. It maps out each Global Compact’s development process and set of objectives. In September 2016, the United Nations General Assembly (UNGA) unanimously adopted the New York Declaration for Refugees and Migrants, which seeks to provide a blueprint for a more humane international response to the mass migration of people fleeing war, poverty and unemployment, and political persecution. The Declaration sets out a host of commitments that reaffirm the obligations and commitments of Member States to refugee protection and calls on Member States to ensure the “full and effective application” of the 1951 Refugee Convention and the 1967 Protocol “and values they embody” (para 65). The Declaration also pledges to enhance protection of people on the move and whose rights are at risk. The UN Refugee Agency’s protection chief, Volker Türk, deemed the New York Declaration a “once in a lifetime chance” for refugees and migrants. The Declaration yielded a commitment by Member States to develop a Global Compact on Refugees (GCR) and a Global Compact on Safe, Orderly and Regular Migration (GCM). What is the function of the Global Compacts? The Global Compacts seek to generate renewed political will among UN Member States to protect refugees and those who are on the move around the world and whose rights are at risk. Both Compacts recognize and articulate the common responsibility of Member States to address the challenges, shared management, and opportunities of large-scale flows of refugees and migrants. However, each Compact has a distinct development process and set of objectives. How are the Global Compacts created? The UN Refugee Agency (UNHCR) is leading the development of the GCR, in consultation with UN Member States and all relevant stakeholders (such as faith-based agencies, academics, the private sector, and media). The GCR provides a basis for predictable and equitable burden- and responsibility-sharing. It builds upon the existing international refugee protection regime, international refugee law, and broader human rights law. The Final Draft of the GCR was released by the UNHCR on June 26, 2018. It will be proposed for adoption by the UN High Commissioner for Refugees in his 2018 annual report to the General Assembly, so that it can be considered at UNGA’s seventy-third session, in conjunction with the annual resolution on UNHCR. The GCM is being shepherded by co-facilitators Mexico and Switzerland, with assistance from the International Organization for Migration. Both Mexico and Switzerland previously hosted the Global Forum on Migration and Development. The GCM deals with “all aspects of international migration” and is intended to uphold the sovereignty of states and foster international cooperation among all actors on migration. The Migration Compact draws on the purposes and principles of the UN Charter, the Universal Declaration of Human Rights, the International Covenant on Civil and Political Rights, the International Covenant on Economic, Social and Cultural Rights, and other core international human rights treaties, as well as on the 2030 Agenda for Sustainable Development. The GCM aims to improve management of migration and to protect the rights of vulnerable migrants from the time they leave their countries of origin, during transit, and when they reach their destinations. The GCM text was finalized on July 11, 2018 and will be brought forward for adoption at a special summit meeting in Marrakesh, Morocco in December. What is in the Refugee Compact? Greater efforts to resolve protracted refugee situations. The Compact includes a Comprehensive Refugee Response Framework and a Programme of Action. Support conditions in countries of origin so that refugees can return in safety and dignity. The Programme of Action is intended to facilitate the application of the framework. It has two parts. Part A addresses mechanisms for more equitable and predictable burden- and responsibility-sharing. It responds to the reality that more than 85 per cent of refugees reside in developing countries that often lack the means to accommodate them, and that few are able to move beyond the first country of asylum. Part B sets out concrete and mutually reinforcing contributions to support host states and countries of origin, where appropriate. It aims to build strong partnerships and encourage participation among refugees and host communities, while considering age, gender, and cultural diversity. It also seeks to broaden the scope of international protection to include those with disabilities, older persons, children, and people of all genders. Since February 2018, the framework has been formally applied in Africa (Chad, Djibouti, Ethiopia, Kenya, Rwanda, Uganda, Zambia, and Somalia) and in Central America (Belize, Costa Rica, Guatemala, Honduras, Mexico, and Panama). What are the objectives of the Migration Compact? Each of the following 23 objectives contains a commitment, followed by a range of actions to achieve safe, orderly, and regular migration. Strengthen international cooperation and global partnerships for safe, orderly, and regular migration. UN Member States have approved the final text of the GCM, but the United States, Hungary, and Australia have said that they will not sign the deal. What gaps still exist in the Global Compacts? During the Global Compacts negotiation process, UN Member States were adamant that obligations should not be binding; thus neither is legally binding. There is no particular mention of climate change as a factor in the displacement and movement of people. While both Compacts refer to climate-related causes, they do not call for the creation of new legal processes to document and manage climate-induced migrants. According to the UNHCR, climate change is a “threat multiplier” that sows the seeds of conflict and makes displacement much worse. 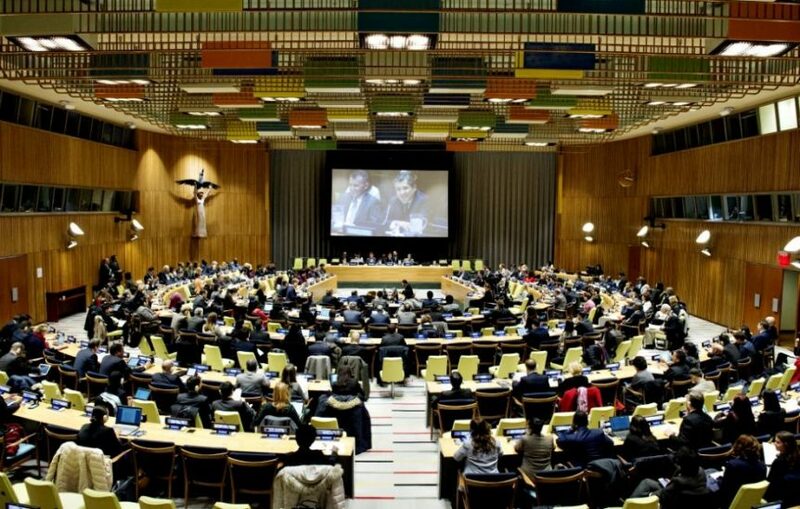 While the Global Compacts include follow-up mechanisms and regular review plans to facilitate stocktaking, some experts say that they still lack concrete mechanisms for governments to implement them. Also, fixed targets or quotas have not been assigned to the different commitments by states.